Gerald A. 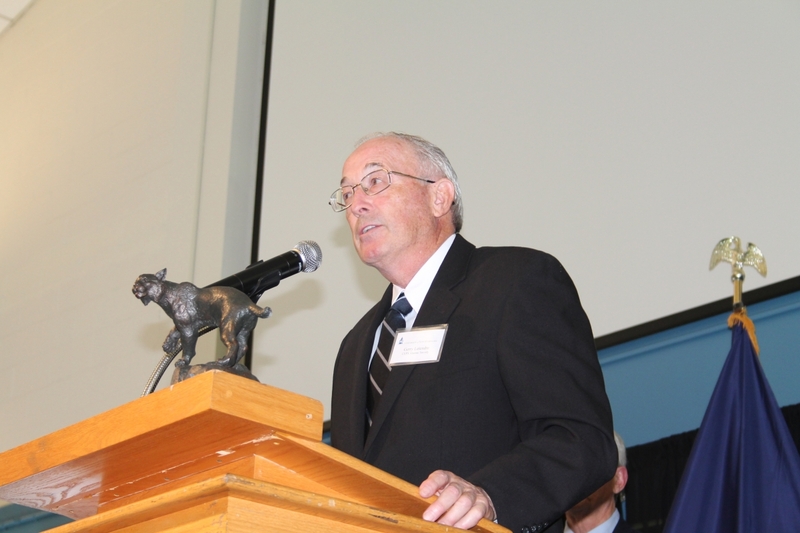 “Gerry” Letendre, Sr. ‘63 of Hollis, New Hampshire, has a strong, long-standing commitment to his state and his alma mater, which he serves as a member of the College of Engineering and Physical Sciences (CEPS) Advisory Board. On September 12, 2013, Letendre was honored with the 2013 CEPS Alumni Society Distinguished Alumni Award - the college's most prestigious award - at the annual Scholarship Awards Ceremony held at the Memorial Union Building. Gerry began his academic career in Durham, graduating from UNH with a B.S. in mechanical engineering. He then went on to Rensselaer Polytechnic Institute, where he earned his master’s degree in mechanical engineering. After graduation, Gerry began his career as a senior analytical engineer for Pratt & Whitney Aircraft in East Hartford, Conn. He also served as a project manufacturing engineer at Hitchiner Manufacturing Company in Milford, N.H., before joining Hollis, N.H.-based Diamond Castings & Machine Company as general manager in 1969. Gerry was elected president of Diamond in 1972 and later that year acquired controlling interest in the company. Since that time, Gerry has grown Diamond from a single, small building to a facility that spans more than 80,000 square feet, making major investments in research and development and capital equipment, which facilitate excellence that differentiates Diamond from its competition. Today, Diamond produces monthly inventory valued at $1.5 million for major clients that include Harley Davidson, Briggs and Stratten, Polaris, and John Deere. Frugality and a wise use of resources are hallmarks of Gerry’s success and to the continued success of Diamond. Gerry is committed to the manufacturing industry and the role it plays in ensuring the U.S. remains a competitive force globally. He supports this conviction through his role as director of the National Association of Manufacturers. With ingenuity, quality, customization, and work on the cutting edge—principles exemplified by efforts at Diamond—Gerry believes that the U.S. will maintain a technological advantage in the manufacturing industry worldwide.